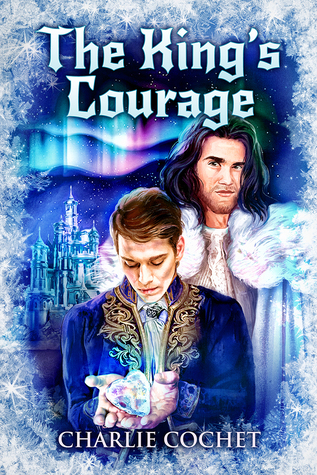 I absolutely loved The King’s Courage by Charlie Cochet. I’ve had many friends’ praise Charlie’s writing and storytelling ability, and now that I have finally gotten the chance to read one of her books, I have to agree. The King’s Courage is fabulous. Charlie had me laughing and giggling and then falling in love with Dasher and Eirik, even though they made me cry three times. And I still can’t believe how much feels and plot Charlie managed to get into such a short book. I have read books twice as long that hasn’t been this detailed. The writing makes you feel like you are there with them and experiencing what they are doing and feeling. I love this play on the North Pole and Santa and his eight reindeer. Except, instead of their being reindeer, they’re the fabulous Rein Dears who are elves and work at North Pole City in the Rein Dear Squadron under the watchful eye of Mayor Kringle. In the sixth book in the North Pole Tales series, we get the wedding of Jack Frost and Rudy Rein Dear which is only three weeks away. Everyone travels to Jack’s palace in Svalbard, Norway, where the happy couple will exchange vows beneath the northern lights. There are festivities planned that lead up to the wedding, and Dasher Rein Dear, a Christmas elf, eagerly anticipates the fun. He also is eager to stay under the same roof as the blustering winter spirit who’s caught his eye, the King of Frost, Jack’s father. Dasher meets the King of Frost, Eirik, in the fourth book, Loving Blitz, when they were searching for an Elska rose and the King of Frost happens to have one. Dasher has been fascinated with him since then. But a long-ago tragedy has left Eirik afraid ever to love again. As the King of Frost, Eirik maintains his distance from everyone, including his only son, Jack. With everybody coming to the palace he’s forced to interact during the festivities and is worn down by the young Christmas elf who insists on intruding on Eirik’s solitude. Dasher is determined to find a way to show the lonely king that his heart still beats and he shouldn’t fear to allow it to beat for another. I loved watching Dasher force Eirik to come out of his shell and have fun again. They are a great couple that compliments each other. I can’t wait to read the rest of the series, and I have already picked up the first two book in the series to get started. If they are as good as this book is then I will be a happy camper. I would like to thank Levi Read for allowing me the honor of reviewing this book since he usually snaps all of Charlie’s books as fast as they come out and claims them as his precious.